When ignition switch is turned to ON, the indicator light illuminates, then goes off if the ESC system is operating normally. The ESC indicator light blinks whenever ESC is operating or illuminates when ESC fails to operate. Never press the ESC OFF button while ESC is operating. 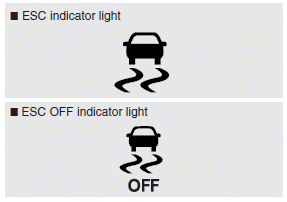 If the ESC is turned off while ESC is operating, the vehicle may go out of control.